This managing ethics training video will help your managers and supervisors develop an ethical leadership perspective in order to sustain a culture of integrity among all employees. The Spanish version of Managing Ethics replays the scenarios portrayed in its award-winning companion training video, Workplace Ethics, but this time from the leader’s point of view, illustrating essential management skills. Ethics shouldn’t be taken for granted. Without constant attention, ethical standards can be weakened by small decisions that add up. 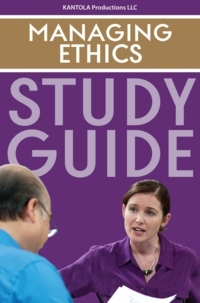 This Spanish-language ethics training DVD gives your managers the tools they need to uphold standards and protect the integrity of your organization.